​It has been estimated that on average a school-age child using a disposable lunch generates 67 pounds of waste per school year. That equates to 18,760 pounds of lunch waste for just one average-size elementary school. If you're like us, you're always on the lookout for small changes that make a real difference in the world, and packing a waste-free lunch is once such change that's easy to make. In this scenario very little trash is generated because foods are bought in bulk or in larger packages. The packaging is left at home for reuse or recycling. 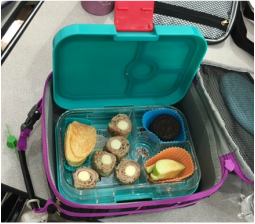 Food waste also decreases because with a reusable lunch container, children can re-pack uneaten food instead of dumping it, packaging and all, into the school trash can. Education is the first step in the transition to a waste-free lunch. Talk to your children about why the school has decided to institute a waste-free lunch program. Provide them with age-appropriate information about the negative impact of a disposable lunch. Below is a list of suggestions that will help build communication and foster understanding. Teach children about recycling at home. Encourage them to help separate the recyclables from the non-recyclables. When you choose not to buy an excessively packaged item, point it out to your children and ask if they can think of some earth-friendly packaging alternatives. If possible, take a trip to your local landfill or recycling facility. Find books on waste reduction at your local library or bookstore. Read them together and discuss how these issues relate to your lives. Discuss where foods come from and how much processing occurs before they get to your table. Search your local, preferably used, bookstore for some good health-oriented cookbooks, including some with large color photographs that you can share with your children. Read them together, look at the photographs, and ask your children to show you which recipes they find most appealing. Make a shopping list together, buy the necessary ingredients, and give the recipes a try. Pack the leftovers for lunch. When eating out, favor restaurants that use reusable plates, cups, and utensils. Talk with your children about why you're making that choice. If you don't finish your restaurant meal, take it home in a reusable container that you've brought from home instead of using the disposable container that restaurants offer. Read this list with your children. Ask them to circle the foods they'd like to see in their lunchboxes. If you don't do so already, try packing lunches the night before and keeping them in the refrigerator overnight. Make your children responsible for adding the ice pack and placing their own lunchbox near the door or in the car. Teach your older children how to make nutritious, waste-free lunches and then let them make their own lunches. Older children can also be responsible for washing their reusable lunch containers or rinsing them and putting them in the dishwasher. Children of all ages can take responsibility for putting recyclables in the recycle bin. Cut up fruits and vegetables. Children often take 1 or 2 bites out of an uncut apple or banana and throw the rest away. To avoid this, pack cut-up fruits and vegetables in a reusable container. Your child can take a few bites and save the rest for later. Pack drinks in reusable containers. Children cannot reseal juice boxes, cans, or pouches. Often they drink half (or less) and throw the rest away. To get the most out of your money, buy drinks in larger containers. Send a small amount to school in a reusable container. (Recycle the bottle at home.) Remember, children need plenty of water, so consider making water your beverage of choice. Before offering your children an afterschool snack, request that they finished their lunch. How many times have you given them a snack and then dumped the contents of their lunch box into the trash? Ask your child to bring home lunch leftovers. Looking at leftover lunches is a great way to get information about your children's lunch preferences. Find out why certain foods have come back uneaten. Did your child not like it? Was she not hungry enough to eat everything in the lunchbox? Was there a birthday celebration at school that day? Did she share someone else's lunch instead? Maintain a dialogue without criticizing. Consider making a list of foods that your child likes to eat for lunch and update it regularly with input from your child. You may find that she prefers romaine lettuce to red leaf lettuce. By making this simple change, she might start eating salads more regularly. Providing a dip for carrot and celery sticks might make eating them more fun. Encourage your children to help plan, prepare and pack their own lunches. They're more likely to eat a meal that they've helped prepare. Involvement in meal preparation also teaches them where their food comes from, and it provides them with the confidence and skills they will need to prepare food for themselves later in life. Younger children can cut fruit or make their own trail mix from a selection of healthy items such as raisins, dried apricots, sunflower seeds, whole-grain cereals, and pumpkin seeds. The above information was excerpted from The Laptop Lunch User's Guide: Fresh Ideas for Making Wholesome, Earth-friendly Lunches Your Children Will Love. Copyright 2002, Morning Run Press. Easy Lunchboxes also available: $11.50 for a set a four and the lunch tote is $6.50. Target, Walmart, Home Goods, and many other stores in the area carry similar products.